I have ditched SPB Mobile Shell 3D now. It’s a little bit heavy in memory usage and the biggest problem that I have, is that it doesn’t support scrolling widget. While the 3D stuffs and other bits and bobs look great, it’s just not practical enough to use SPB Mobile Shell 3D as the home screen. I am sure it will improve later on but for now, it’s just not for me. By the way, it costs £9.12. Go Task Manager is the best add on. It is a widget that displays all running apps and games. You can just tap on the apps and games that you wish to end or even end all by tapping the ‘X’ button. I can now uninstall all my task manager apps. Did I mention that it has no ads? Ads can be annoying at times especially when new developer does not know how to position better. A couple of weeks earlier, I installed an app where the ads were positioned right in the middle of the app. The first ad on display was Iphone accessories and I couldn’t really relate an Android phone with an app which displayed Iphone accessories ad right in the middle of the app. How weird and certainly not so coincidence! 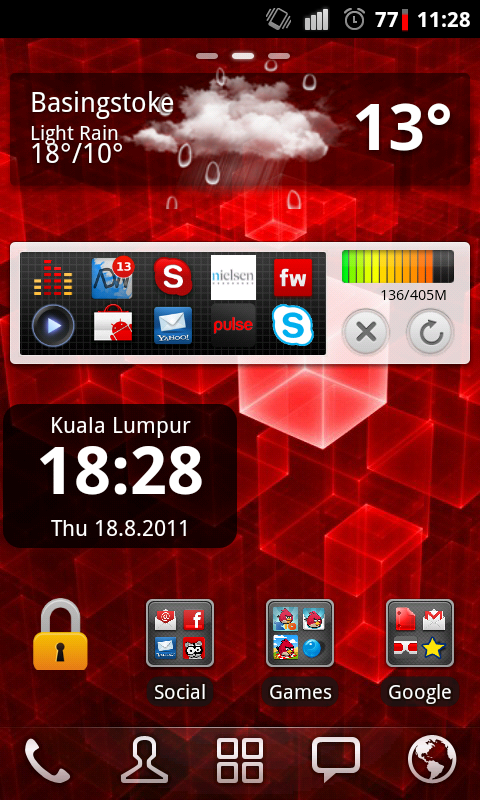 Anyway, I kind of configure my HTC Desire to how I want it to look. However, at the back of my mind, I keep thinking that it’s only a matter of time until I get bore with it again, just like the previous custom ROMs and home screens that I have used. I hope not!